Do you feel like sports bar food? But don’t want to leave home? This recipe is perfect for you. 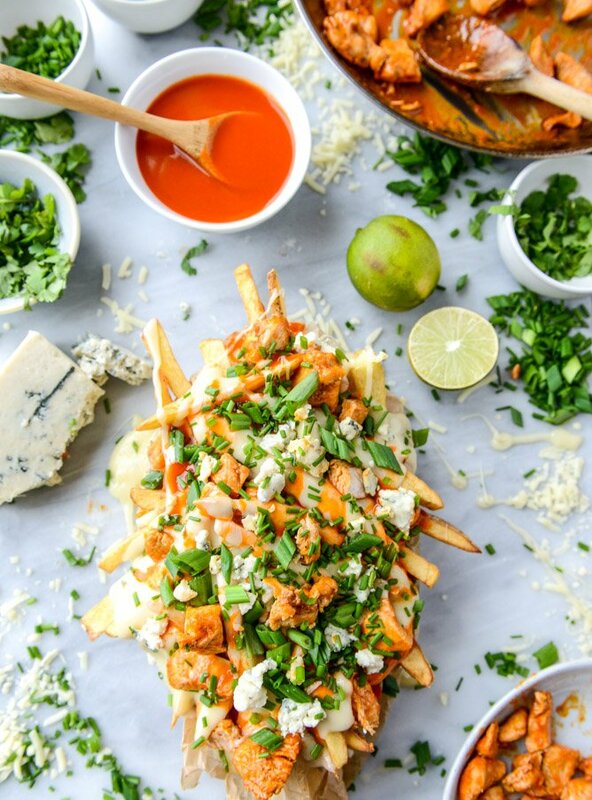 These Buffalo Chicken Beer Fondue Fries are mouth watering and bring the sports bar experience right to your home. Here’s some photo instructions and the recipe at the bottom. You can cut your own fries but store bought fries work as well. Beer cheese fondue! This is how cheese fries should be done. We are getting hungry just typing this. To make the homemade fries, slice the potatoes and place them in a large bowl. Cover with cold water and let sit for one hour. Drain and pat dry with paper towels. Heat 3 to 4 inches of oil in a large pot fitted with a candy thermometer. Once the oil reaches 350 degrees F, add a handful of potatoes and fry for 2 to 3 minutes. Remove and place them on a paper towel; repeat with other potatoes. When they are all finished frying once, you want to fry again. Add a handful of fries again and fry for 1 to 2 minutes, until golden and crispy. Remove and place on a new paper towel to drain. To make the chicken, eat a large skillet over medium-high heat and the add olive oil. Toss chicken with salt and pepper, then add to the skillet and cook until browned on all sides, about 8 to 10 minutes. Once cooked through, add the garlic and stir for 30 seconds. Add in buffalo wing sauce and butter. Stir to toss and coat. Place the fries in a bowl or on a plate – or leave on the baking sheet! Cover with some of the cheese sauce, then a drizzle of wing sauce and some chicken. You can do the fries in layers too. As as much cheese sauce as you’d like, all of the chicken, lots of extra drizzles of wing sauce and crumbled gorgonzola. Cover with green onions, chives, cilantro and a spritz of lime. If desired, you can also add a drizzle of ranch on the fries. To make the beer cheese sauce, heat a small saucepan over medium heat and add butter. Once sizzling, whisk in flour and stir for 1 to 2 minutes until golden and fragrant and bubbly. Add in beer, whisking well to combine, then reduce heat to low and add cheese, stirring until totally melted and smooth. Keep over low heat and stir every few minutes until drizzling over fries.